Custom, Bespoke Stainless & Mild Steel Fabrications Designers Bridgwater, Somerset. Using the latest SolidWorks software, we aim to work with you to produce drawings that will show you a 3D model of the finished product, before progressing to manufacture. By preparing drawings including 3D models, it enables us to rule out any potential issues that may occur during the project and where required carry out FMEA risk assessments. 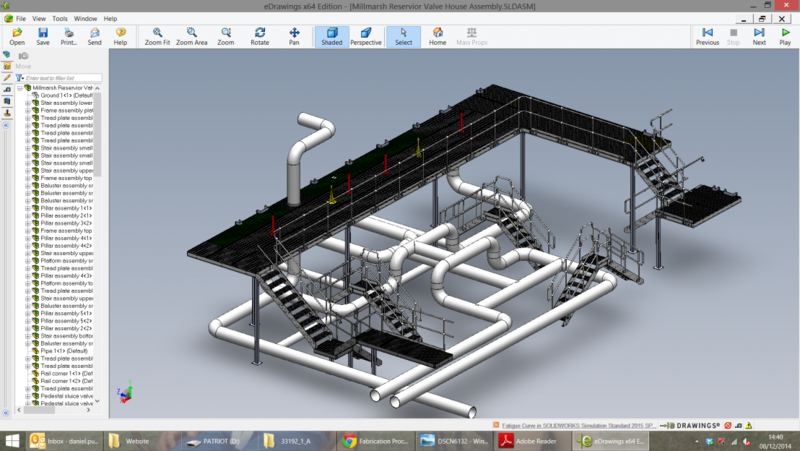 SolidWorks delivers us robust 3D design capabilities and performance. Not only can we create fully detailed parts, assemblies, and production-level drawings, but we can access all the tools required to generate complex surfaces, sheet metal flat patterns, and structural welded assemblies. We can use perform stress analysis, and determine the environmental impact of components.